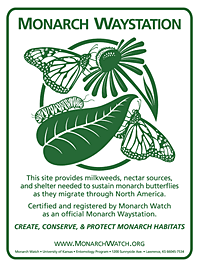 Willow Springs Nursery is happy to announce our registration with MonarchWatch.org as a participant in the M onarch Butterfly Waystation program. Monarch Waystations are places that provide resources necessary for monarchs to produce successive generations and sustain their migration. Monarch populations have declined as much as 90%. This is primarily due to habitat loss. Monarch caterpillars feed only on milkweed plants. These plants have been nearly swept from the landscape due to herbicide use in and around croplands and other habitats. We all can help to reestablish this beautiful and valuable creature. It is easy to do. Almost all of us have some place in the garden or yard where we can establish a Waystation. All that is required is planting the correct flowers that will attract and sustain the Monarchs. Willow Springs Nursery has the flowers and expertise to insure your Waystation will be a success. Feel free to contact Willow Springs and MonarchWatch.org for more information on this important effort.